« On the cliff again. This entry was posted on December 17, 2012 at 12:18 am and is filed under Uncategorized. You can follow any responses to this entry through the RSS 2.0 feed. You can leave a response, or trackback from your own site. well, we won’t be seeing it for a couple of weeks at least, I think… so it’s really nice to see such a positive reaction. we do know the story, some, not people who’ve been reading it annually for most of their lives, but some. I was a hold-out too! Just couldn’t bring myself to read the Trilogy or any of the rest for a really long time, partly because everybody was so over-the-moon about it! When I married, teh DH was a fan, but reasonable. When the kiddo came along, I knew I’d have to read it sometime, 8-). So I was probably at least 50 (he’d be 5…) think it was a bit later than that. We read the Hobbit first, then started on the Trilogy when we heard the movies were coming. I have read the Hobbit more times than I can count. Still that movie transported me. Yes, there are differences. Otherwise those of us who know the story so well would be saying the dialogue along with the characters and spoiling it for you. Apparently, much that was not in the book came from other writings by Tolkien to give depth and context for the central story. The tone of the Hobbit is different from LotR in part because of its audience. As I understand it, Tolkien wrote the Hobbit 1st as a story for his son, then went back and wrote the darker saga. Personally, I don’t like LotR and didn’t see the movies (pauses here to let cried of blasphemy pass) but am looking forward to the Hobbit. It was the 1st real fantasy other than fairy tales I was exposed to and I’m hoping to get as much enjoyment from the movie as my 6 yr old self did the book. The Hobbitt is a MUCH easier read – LOTR is tedius and I suffered through all three volumes (why? For the sake of my girlfriend who insisted and the fact that I really am a fan of Sci-Fi and (some) fantasy), but I loved reading The Hobbitt. 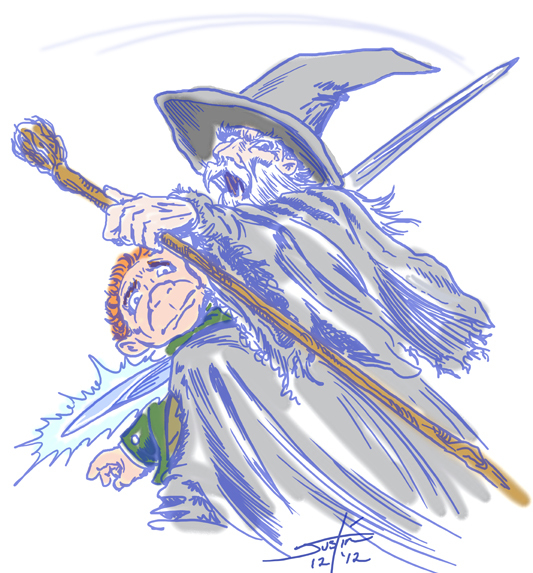 The Hobbitt is plot driven – LOTR has far too many digressions into Myth and history for my taste. (Tolkein was trying to create a complete mythology – ergo, that’s why it’s written that way – I understand that; I just don’t have to like it). I finally read Tolkien with “The Hobbit.” I wanted to see what was in, what was new, how they were doing it with additions from other fragments and notes. They went about a third of the way in. They remade sections of it, Gandalf is in it much more than in the novel. I liked it myself. The 3 Ring stories were very interesting. I give it high marks.